Thursday, February 14, 2019- 8:00 a.m.
Pursuant to A.R.S. § 38-431.02, notice is hereby given to the members of the Economic Development Advisory Commission (EDAC) and to the general public that the EDAC Commission will hold a meeting open to the public on the above date, time, and location. Minutes of its proceedings shall be taken and filed with the Town Clerk for Public Inspection. Members may attend the meeting telephonically occasionally. ACTION MAY BE TAKEN BY THE COMMISSION ON ANY ITEM LISTED ON THIS AGENDA. Revisions to the agenda can occur up to 24 hours prior to the meeting. The Commission may decide to change the order in which items are heard at the meeting. As a courtesy to others, please turn off or put in silent mode all pagers and cell phones. Welcome to this Economic Development Advisory Commission (EDAC) meeting. Regular Commission meetings are usually held the second Thursday of each month at 8:00 AM at the Public Services Center, although the date or time may change and additional meetings may be called at other times and/or places. Contact the Town Clerk or watch for posted agendas for other meetings. All persons attending the Commission meeting, whether speaking to the Commission or not, are expected to observe the Commission rules, as well as the rules of politeness, propriety, decorum and good conduct. Any person interfering with the conduct of the meeting or otherwise not following the Commission rules will be removed from the meeting. 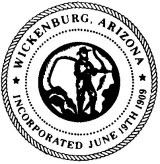 To better serve the citizens of Wickenburg and others attending our meetings, the Public Services Center is wheelchair and handicapped accessible. Persons with a disability may request a reasonable accommodation by contacting the Town within 48 hours of the scheduled meeting at 928-684-5411 (Voice & TTY). Copies of the agenda are available the day of the meeting at the Public Services Center or online at www.wickenburgaz.org. For questions about the Commission meetings, special services or procedures, please contact the Town Clerk, at 928-684-5451, Monday through Thursday from 7:00 AM to 6:00 PM. AT THIS TIME, MEMBERS OF THE PUBLIC MAY COMMENT ON MATTERS NOT ON THE AGENDA. HOWEVER, THE OPEN MEETING LAW LIMITS THE COMMISSION’S COMMENTS TO: RESPONDING TO CRITICISM, ASKING STAFF TO REVIEW A MATTER COMMENTED UPON, OR ASKING THAT A MATTER BE PLACED ON A FUTURE AGENDA FOR DISCUSSION AND/OR ACTION. Which may contain updates on: Economic Development Advisory Commission, Library Advisory Board, Trails Commission and/or the Parks and Recreation Commission, Economic Development Projects, Operational Updates on Economic Development, Community Relations, Marketing, Special Events, Facility Rentals, Natural Resources, Library/Learning Center and Workforce Development Projects and activities and/or strategic initiatives that involve collaboration between referenced commissions.